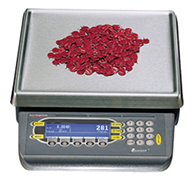 The PC-820 is a high resolution, full featured counting scale. It comes set in its simplest form, ready to count but with all other operational functions turned off. The distributor/user may either accept all default setup parameters or refer to the configuration setup list and change most operational parameters. The standard PC-820 is set for 10,000 divisions in the weigh mode.